Do you understand the difference between acute and chronic wounds? If you answered that acute wounds are wounds that have been present for a shorter duration of time, you are correct--but there are many other differences in acute and chronic wounds that are not as obvious and must be taken into account when planning care. Although there is no true definition for acute and chronic wounds, it is widely accepted that the following is true: acute wounds progress through the normal stages of wound healing and show definite signs of healing within four weeks, while chronic wounds do not progress normally through the stages of healing (often getting ‘stalled’ in one phase) and do not show evidence of healing within four weeks. Hemostasis: This is the clot that is formed initially at the site of injury to control bleeding. It is comprised mainly of platelets. The endothelium of blood vessels that are exposed by the injury stimulate platelets to release certain factors, which result in vasoconstriction and initiation of the clotting cascade. Thrombin, prostaglandins, growth factors and other cytokines are released at the site of the injury, whose job it is to attract inflammatory cells to the area, as well as increase their production and migration. Many conditions can interfere with the formation of a clot during hemostasis, such as venous insufficiency, diabetes, thrombocytopenia and other blood dyscrasias. Conditions such as these may lead to poor wound healing, therefore careful management of these conditions will be important in the normal process of wound healing. Inflammation: Within hours of clot formation, neutrophils travel to the site of injury and adhere themselves to the endothelial cell walls of the damaged vasculature. These neutrophils provide protection against infection as they phagocytize bacteria, dead tissue and any foreign material present. Neutrophils also produce inflammatory mediators that activate and recruit fibroblasts and epithelial cells to the injury site. When neutrophils are depleted they are replaced by macrophages, which help to rid the wound of devitalized tissue and produce elastase and collagenase. Macrophages also prompt an ending of the inflammatory phase and the beginning of the proliferative phase of wound healing. Unfortunately, inflammatory mediators can cause tissue damage and may sometimes prolong the inflammatory phase of healing. Therefore, any process which increases neutrophils (and thus inflammatory mediators) can lead to prolongation of the inflammatory phase, which may be evident to the astute clinician as an increase in exudate. When wounds are stalled in the inflammatory phase, proper management of exudate is an important step in assisting wounds with moving on to the proliferative phase. Proliferation: During this stage, the wound decreases in size and fills with new connective tissue (contraction, granulation and epithelialization). Granulation tissue is composed of fibroblasts, macrophages, blood vessels, immature collagen and an extracellular matrix. As macrophages begin to decrease in number, other cells, including keratinocytes, fibroblasts and endothelial cells, begin to produce and release growth factors and continue to multiply. As granulation tissue grows, it stimulates collagen production and fibroblasts, which provide the new scaffolding by promoting the migration of endothelial cells and fibroblasts into the wound. The growth of granulation tissue results in filling of the wound and narrowing of wound margins. Eventually the wound closes off and forms a scar. During the proliferation phase, maintenance of a moist wound environment and protection of newly growing tissues is crucial. Any process or condition that interferes with either of these may result in prolongation of the proliferation phase. Remodeling: In this phase, collagen remodels, proliferates and matures, a process that can take many months. Tensile strength increases but will never achieve the strength present before the injury occurred. At best, tensile strength may be 80%. What Makes a Wound a Chronic Wound? Why is it that some wounds progress smoothly and rapidly through the phases of healing, while others stall and become trapped, most often in the inflammatory phase? Although no two wounds are the same, factors that predispose to a chronic wound are similar. 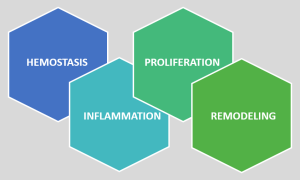 Inflammatory mediators: Increased levels of inflammatory mediators result in damage to growth factors and the extracellular matrix that are necessary for healing to take place. If we were to examine most chronic wounds at the cellular level, we would likely find an imbalance in cytokines, growth factors and/or MMPs. Wound infection: Bacteria release enzymes and MMPs that reduce growth factors and degrade the fibrin necessary for healing. Bacteria increases the inflammatory response, and chronic wounds often have high levels of bacteria present in the wound. Obviously, reducing the bacterial burden will improve the chances of healing. Biofilm: A biofilm is a complex structure of microorganisms that has the ability to adhere to a surface, which protects the bacteria contained in it. As we learn more about biofilms, it is becoming increasingly apparent that biofilms play a large role in the production and maintenance of the chronic wound environment. Hypoxia: Hypoxia impedes wound healing and allows certain negative entities, such as bacteria, to flourish. Hypoxia impedes fibroblast proliferation and collagen production, both of which are crucial to wound healing. Many common chronic conditions result in hypoxia, including cardiovascular disease, smoking, pulmonary diseases and peripheral vascular disease (PVD). Attention to proper management of these conditions can improve wound healing. Poor nutrition: A diet that does not provide enough protein will lead to delayed wound healing. Wounds will remain in the inflammatory phase of healing as long as the patient remains in a catabolic state, which causes decreased fibroblast formation. Improving the patient’s diet can improve wound healing and change a chronic wound into a wound with the possibility of healing completely. Whether the patient cannot afford to eat well, is unable to prepare nutritious food, or has anorexia due to a disease state, the clinician should make every effort to identify and overcome any barriers to adequate nutrition. There are, of course, other factors that influence wound healing, but these are some of the most important ones. When it comes to chronic wounds, it’s obvious that attempting to determine the underlying cause of failure to progress in a timely fashion through the stages of healing is the key to turning a chronic wound into a healing wound. Laurie Swezey RN, BSN, CWOCN, CWS, FACCWS, is a Certified Wound Therapist and enterostomal therapist, founder and president of WoundEducators.com, and advocate of incorporating digital and computer technology into the field of wound care.